Although you can stop in ahead of the opening, unframed prints and most of the smaller items like lapel pins, won’t be available until the opening and some will ONLY be available during the opening. I will be in attendance all night. Looks like it will be a soggy chilly night here in Portland, but I’ve got a bowl full of candy and stickers ready for any hardy trick-or-treaters! I’ve carved a few pumpkins to ward off the evil spirits and even went extra traditional with a turnip this year! Why a turnip? 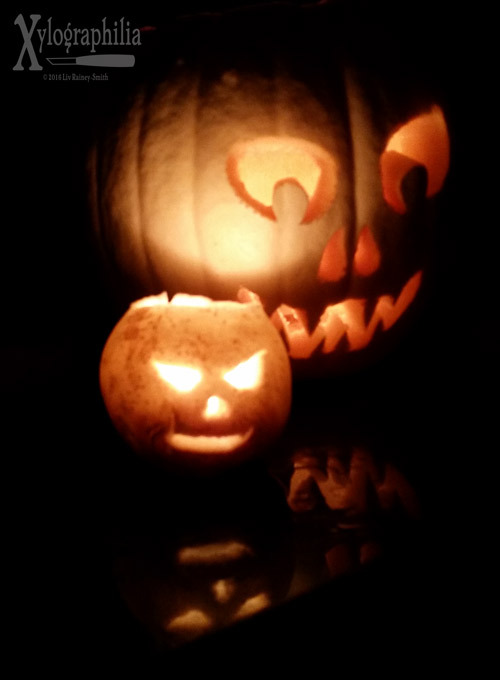 Pumpkins are a plant from the Americas and the Samhain tradition of warding off evil with grotesque vegetable lamps began before such crops were imported to the British Isles. If you decide to try turnip carving for yourself, be wary of the hollowing out portion, I nearly cut myself with a paring knife. I found a sturdy spoon to be fairly effective for scraping once I’d bored a hole into it. 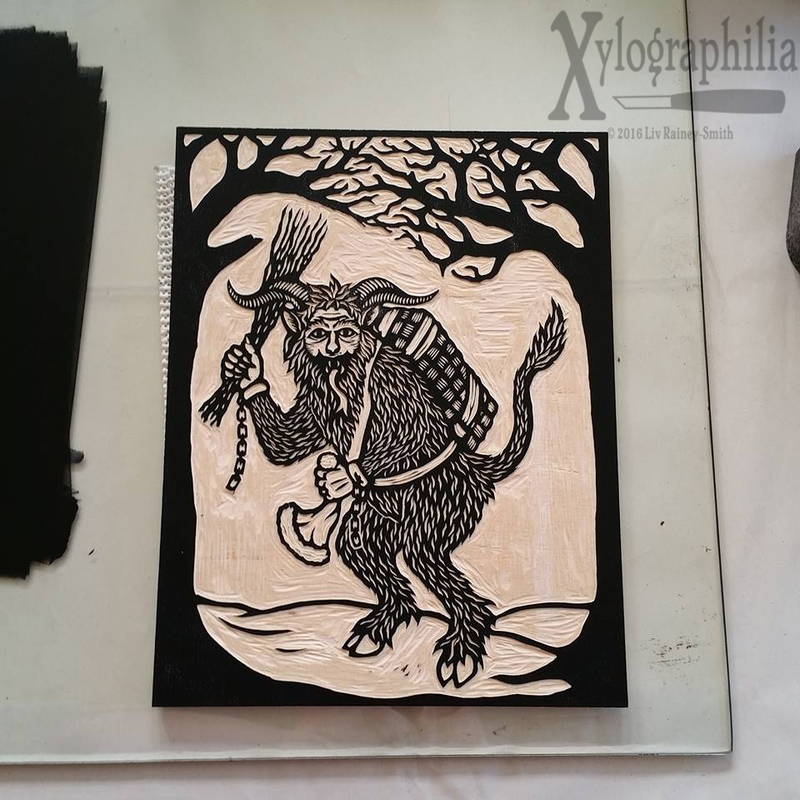 The orange pumpkin is based on my Black Shuck woodcut which originally appeared in Arcanum Bestiarum. It was carved with inexpensive woodcut and linoleum tools. I’m hoping I’ve shaved the pumpkin wall enough to get a good glow out of it tonight! I will be in attendance and we’ll have a selection of my Sigh Co Graphic shirts as well as prints and lapel pins. Show will hang approximately one month. This is a great opportunity to visit an eclectic array of local artists and craftspeople. I’ll have a somewhat limited selection due to space constraints, so please e-mail me if you would like me to have something specific on hand. First 35 visitors in the door will receive a gift bag, which from what I’ve seen in the past is rather nice, so queue early if you’d like a shot at receiving one. Last but not least, Krampus enamel pin pre-orders will ship November 7th. I expect to have them done just before the Wells & Verne show, but I won’t have time to package and ship them ahead of the show. If you’d like to pick yours up during the opening party on November 4th, let me know. Patron subscription packages will also be shipping in early November. If you’d like in on this shipment, pledge via Patreon before October ends! Rewards for pledges made in November will ship in early December. Here’s my guest schedule for the H.P. Lovecraft Film Festival. Please note, I’m also vending upstairs in the theatre, and while I won’t be at the table every second of every day, it’s a good place to find me. Artists discuss the sources and styles that influence their work, whether it be representation or scenes from HPL stories, or just inspired by cosmic horror. Moyer (M), Carlucci, Dubisch, Denham, Rainey-Smith, Stout, Walls. Pickman’s Apprentice — Artists will compete by creating 1 hour art based on audience prompts! (Yes, I will be carving and printing a woodblock. The Krampus enamel pin will retail for $15, but if you pre-order before October 21st, you pay just $10. Please note, because this is a pre-order there may be some slight changes to the design as the pins are made. Based on my experience with the Raven and Cthulhu pins, the most likely alteration will to be more metal around the perimeter of the enamel. If any major changes are necessary, I will message those who have already ordered with the updated concept art. Wholesale pricing for orders of 12 pins or more is available, contact me for details. Introducing the Cthulhu lapel pin! My newest lapel pin is based upon my original Cthulhu woodcut, which was inspired by the passage below and created in a pseudo-15th Century style. Please note, because this is a pre-order, the finished pin may vary slightly from the concept art above. The Raven pin experienced a couple changes between final concept and production, but they were minor enough to be almost unnoticeable. If any major changes are made to the design during production I will update you. I expect to begin shipping the finished Cthulhu pins no later than mid-September, in plenty of time for the H.P. Lovecraft Film Festival in Portland, OR! One last note, if Cthulhu is not your cup of tea, don’t worry, more pins are in the works. Just as the Raven pin sales assured this second lapel pin could be made, Cthulhu will help with the creation of the next. So if you enjoy enameled lapel pins from independent artists, please spread the word because you really do make a difference by doing so. I’m proud to be participating in the Honey & Venom show at Hive Gallery in Los Angeles. (That’s my Bee in the upper right.) I won’t be able to make the trip down for the show, but if you have the opportunity to see it, the previews look spectacular! I just found out from Silvia Moreno-Garcia that She Walks in Shadows is a World Fantasy Award finalist in the Anthology category! I’m thrilled not just because I am one of many contributors, but because it is a fantastic collection. Moreno-Garcia and Paula R. Stiles put a great deal of work into assembling the anthology and it shows! I’ve had to cut back a bit on work for the past week in order to give the inflamed tendon in my left hand a rest. The process of diagnosis irritated the tendon enough that it went from being a weird sensation to a painful one. The pain mellowed out after a couple days, but I’ve been paying close attention to what actions irritate it, and adjusting accordingly. Thankfully my left hand is not my dominant hand, so I’ve been sketching, researching, scheming, and continuing to carve at about half my normal rate. Aside from working on the project which shall remain nameless, I’ve been exploring the notion of screen printing on alternate materials. During one of the wood veneer printing sessions, I tested a piece of goatskin parchment to see how well the ink would work with it. I bungled my first pass but flipped the piece over and managed to get a good crisp print on the 2nd try. Since the ink has dried, I’ve been handling the piece to see how well it is set in — bending, scratching, rubbing the surface — and I’m pleased with the result. Now the question is, what to do with it? In the past when I have printed my woodcuts on parchment, I’ve offered them much the same as I offer prints on paper. The purchaser chooses whether to frame them, tack them up on the wall, collect them in an album, etc. etc. etc. Paper has some limitations with regards to durability. So does parchment, but it also has different properties and potential uses. It could potentially be stretched over a frame, used in book binding, or sewn in to a larger piece of some sort. If stretched over an open frame, it could potentially be illuminated from behind — mind you, I’m not looking to start a lampshade empire, but the possibility of incorporating light into my art is an interesting one. Now that I know I can print on parchment, I’m keen to experiment with leather as well. I have a fair amount on hand due to my past bookbinding coursework, so I’ve been pulling out my supplies and finding test pieces to print on. You can see a bit of it behind the parchment in the image above. I’ve got a few blues, greens, and reds to work with. and some white and gold screen print ink so I’m not limited to printing only black on light color surfaces. There’s a bit more prep work to do, but I’m looking forward to an experimental printing day soon!